The Dow Jones Industrial Average is a group of 30 large-cap U.S. stocks. The index was created in 1896, and in the years since, is periodically adjusted. Companies that lose prominence are sometimes taken off the list, and are replaced by other companies. In June 2018, retail giant Walgreens Boots Alliance (WBA) was added to the Dow, replacing General Electric (GE). Although Walgreens is a relatively new member of the Dow 30, it is one of the most attractive stocks on the list. Walgreens stock is significantly undervalued today, and the company is growing earnings at a high rate. It is also a strong dividend growth company, with a streak of annual dividend increases that goes back more than 40 years. Walgreens has growth potential, a low valuation, and a 2.5% dividend yield. Over the next five years, Walgreens stock could produce returns above 20% per year. Walgreens is the largest pharmacy retailer in both the U.S. and Europe. The company operates over 13,000 stores in 11 countries. It also operates one of the largest global pharmaceutical wholesale and distribution networks, with more than 390 distribution centers that deliver to upwards of 230,000 pharmacies, doctors, health centers, and hospitals each year. On June 28th, Walgreens reported financial results for its third-fiscal quarter. Net revenue increased by 14% for the quarter, to $34.33 billion, which beat analyst expectations by $280 million. Adjusted earnings-per-share increased by 13.5% for the period, to $1.53, and also beat expectations. Over the first three quarters of the fiscal year, Walgreen’s sales and adjusted earnings-per-share rose 11% and 20%, respectively. These were exceptionally strong growth rates for Walgreens, even though the company is fighting through a number of headwinds. The broader retail environment is extremely challenged right now, particularly for pharmaceutical products, which have seen price deflation in recent years. In addition, the threat of Amazon (AMZN) entering healthcare retail is a constant overhang. Walgreens’ retail business continued to struggle last quarter, with a 3.8% comparable sales decline last quarter. However, the pharmacy side of the business continues to perform well. Pharmacy sales and prescriptions rose 19.3% and 11.8% last quarter, respectively. Walgreens grew its pharmacy market share by 190 basis points last quarter. And, the company reported higher gross profit in pharmacy retail as well. In addition, Walgreens’ pharmaceutical wholesale business is a strong performer. It operates pharmaceutical wholesale through Alliance Healthcare, which produced 4.0% comparable sales growth last quarter. 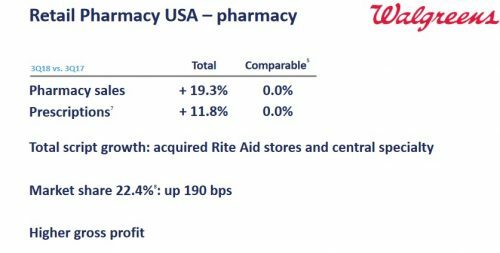 Thanks to its leading position in these segments, Walgreens has positive growth potential over the next several years. Despite the threat of Amazon entering the healthcare industry and the struggles facing brick-and-mortar retailers, Walgreens has multiple catalysts for future growth. First, as a pharmacy retailer, Walgreens will naturally benefit from the aging U.S. population. An aging society will have higher demand for prescriptions going forward. Pharmacy sales account for roughly 73% of Walgreens’ total sales, which means it will naturally benefit from demographic shifts. In addition, acquisitions are a major growth catalyst for Walgreens. Late last year, Walgreens acquired over 1,900 Rite Aid (RAD) stores, as well as three of its distribution centers and related inventory, for $4.375 billion. Acquiring these stores will help further Walgreens’ sales growth. And, because the two companies have such similar operations, there is potential for significant cost synergies. As part of the transaction, Walgreens is undergoing a store optimization program, which will help cut costs by $300 million per year. Acquisitions will also help Walgreens expand its international growth, particularly in emerging markets like China. On July 5th, Walgreens completed its investment in China-based pharmacy chain GuoDa Drugstores. Walgreens purchased a 40% stake in GuoDa, for $416 million. GuoDa operates more than 3,800 retail pharmacies across 70 cities in China. This investment provides Walgreens access to one of the premier emerging markets in the world. China has a population of 1 billion, high economic growth, and recent healthcare reform has opened up a huge growth opportunity. Share repurchases will also contribute to Walgreens’ future earnings growth. On June 28th, Walgreens announced a new $10 billion share repurchase authorization. This represents nearly 15% of the company’s current market capitalization. The authorization has no specific expiration date, but assuming the buyback takes five years, Walgreens could increase its annual earnings per share by approximately 3% per year just from buybacks. Share repurchases help grow a company’s earnings by reducing the number of shares outstanding, giving each remaining share a larger portion of annual profit. Walgreens expects 2018 to be another year of strong growth. The company expects adjusted earnings-per-share of $5.90 to $6.05 this year. At the midpoint of guidance, Walgreens expects 17% earnings growth for 2018. The combination of organic growth, acquisitions, and share repurchases could easily allow Walgreens to grow earnings per share by 8%-10% per year over the next five years. Walgreens stock could deliver high returns over the next five years, thanks to its earnings growth, low valuation, and dividends. Not only is Walgreens expected to grow earnings by approximately 9% per year, the stock is also undervalued. Shares of Walgreens trade for a price-to-earnings ratio of 11.7; this is a very low valuation for a high-quality business with multiple growth catalysts intact. Fair value for Walgreens stock is a price-to-earnings ratio of 16.7, which is its average valuation multiple over the past 10 years. A price-to-earnings ratio of 16.7 would result in annual returns of ~7.4%, just from an expanding valuation multiple. In addition, returns will be boosted by Walgreens’ 2.5% dividend yield. Adding in 9% annual earnings growth, and total expected returns could reach 19% per year. Combined with dividends and earnings growth, Walgreens could produce excellent total returns of 20%+ each year moving forward. This is a very high expected rate of return, which makes Walgreens an attractive stock. It is also appealing for dividend growth investors. Along with the share repurchase announcement, Walgreens also increased its dividend by 10%, the 43rd consecutive year of a dividend increase. 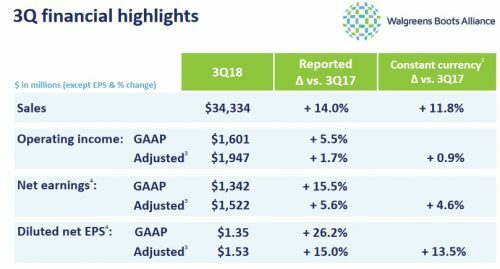 The buyback authorization and dividend increase prove that Walgreens is a shareholder-friendly company, that makes returning cash to shareholders a top priority within the capital allocation program. Walgreens is not immune to the pressures facing the retail industry. However, due to its focus on pharmacy retail, the company still has positive growth prospects moving forward. While investor sentiment remains negative due to the potential risk of Amazon entering the healthcare space, Walgreens continues to execute. The stock could be a buying opportunity, as it appears to be undervalued.